2014 marks the 20-year anniversary of UPS®, one of the world’s largest supply chain companies, and The Salvation Army working together to help strengthen local communities. Through the years, the company’s charitable arm, The UPS Foundation, which annually contributes $100 million to philanthropy, has provided emergency funding, technical support, and in-kind assistance to help The Salvation Army respond to humanitarian crises. In 2010, Craig Arnold, a UPS employee and Salvation Army volunteer, was one of the first people on the ground in Port-au-Prince, Haiti after the earthquake. Arnold coordinated with The UPS Foundation and the Salvation Army team on the ground to arrange UPS humanitarian charter relief flights and introduced UPS tracking technology called TrackPad that provided a scannable credit card for each head of household in the Salvation Army camp, replacing paper cards to ensure that all families received an equitable distribution of food and other essentials and alleviating concerns about violence in the food lines. 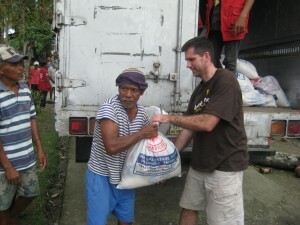 UPS and The Salvation Army teamed up again in the aftermath of Typhoon Haiyan in the Philippines. 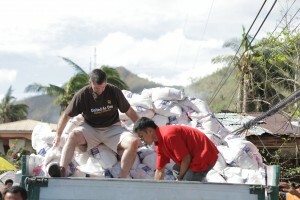 Once again, UPS provided emergency funding, and led by Arnold, provided local truck capacity to help Salvation Army team members deliver one million meals to typhoon survivors in rural communities around Tacloban. UPS supports initiatives in community safety, diversity, the environment, and volunteerism. Last year, UPSers donated 1.8 million hours of service to their communities and deployed skilled volunteers to the Philippines to support the response to Typhoon Haiyan. As an environmentally conscious logistics company, UPS focuses on forest protection and tree planting and provides grants that support planting one million trees in communities around the world. To learn more visit http://www.responsibility.ups.com/UPS+Foundation. The Salvation Army gives thanks for this incredible partnership that has benefitted so many communities in need. To learn more about The Salvation Army’s World Service Office, visit www.sawso.org or show your support here.